Remind you of Jurassic Park? Sunday dawned clear and cold. Thanks to Her most excellent recipe and cooking skills, we enjoyed a fine breakfast of waffles and maple syrup. Because the morning was so fine, we took off for a visit and walk at the Cleveland Metroparks Zoo. We arrived just at opening, easily found parking close to the entrance, and began our stroll. Being early, the middle of winter, and a Sunday morning, few other humans were to be seen. Many of the usual animal greeters were nowhere to be seen. We reached the new Elephant Crossing facilities and decided to go indoors and see the residents. The experience was wonderful. Though built like a set out of Jurassic Park, the elephant barn was clean, warm, and had the scent of fresh hay. The tusked residents were lined up, each in his or her own stall, facing outward. On the other side of the enclosure cables was a line of keeper/trainers, one for each animal. The trainers quietly called out commands, lightly tapping their charges with long cane sticks, and the huge animals responded. Sometimes the elephants would turn around, then stop. Sometimes they raised their trunks. All the while the zoo residents munched on fresh bales of hay. Frequently treat wafers were tossed into huge mouths requested open by trainers. The exercises were not for show; they were valuable interactions designed to keep the giant creatures connected with their people and manageable for common and important tasks. 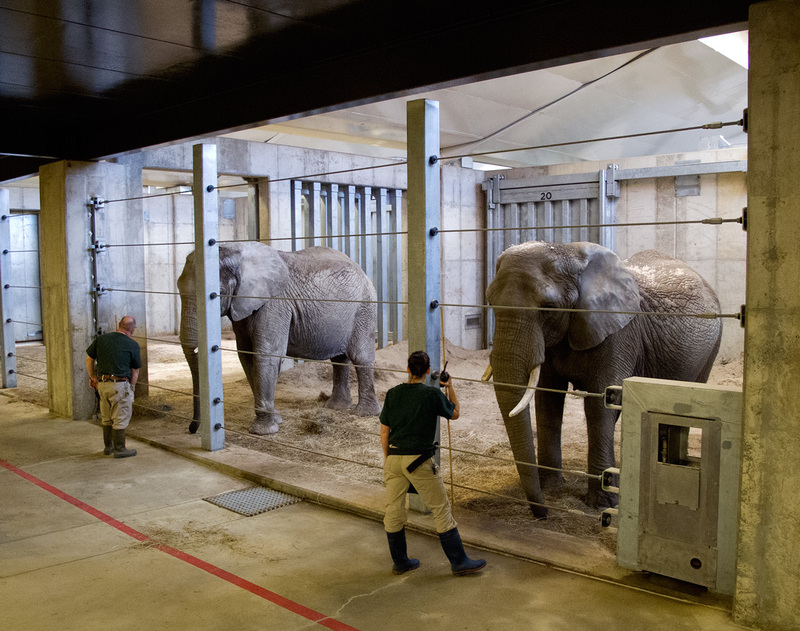 Elephants smoothly moved from enclosure to enclosure, as remotely-controlled heavy partition doors glided open or shut with an echoing metallic boom. We left, smiling, to continue our walk. Along the pathways we saw kangaroos out in their grassy enclosure, the green dotted with patches of snow. Appropriately, we watched antlered reindeer grazing in their snowy run and wolves patrolling their wooded home. When we reached the outdoor lion enclosure we were surprised and delighted to find an African lion lounging in the now-midday sunshine, enjoying a little snack. 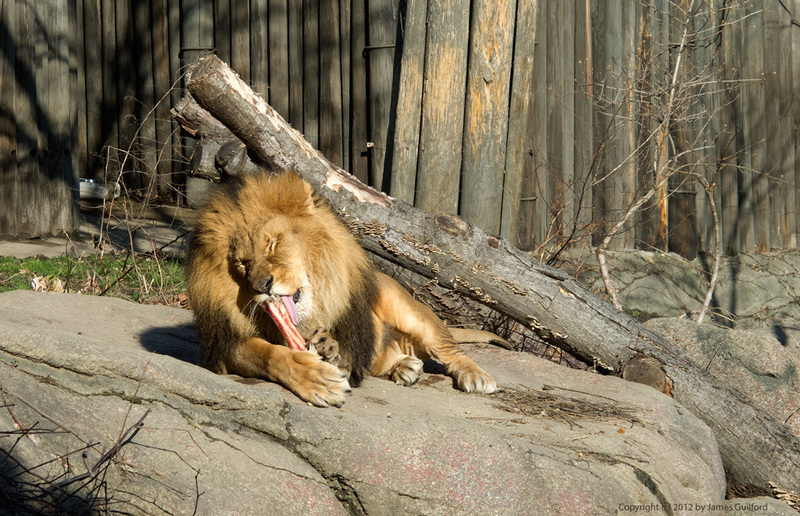 “Leo” was licking and gnawing on some other animal’s leg bone. After lunch we went home. The winds rose. The clouds rolled in. And it snowed. No more sunshine. No more pretty green grass. It was a zooy Sunday. Kitty can haz leg bone! Elephants are my very favorite! Kitty can haz anything he wants!